There are two basic types of Super 8 cameras – those built for the family consumer market which were essentially designed as ‘point and shoot’, and those for the more serious filmmaker which equipped with more functionality and manual controls. The home movie cameras can be characterised as having the simplest level of control and were aimed squarely at the family for home movie use – generally these cameras were only compatible with the widely available 40 and 160 ASA film types. Some of the higher end home movie cameras were quite desirable and whilst Kodachrome 40 reversal stock was available the restricted film compatability was not a problem. However, when Kodak discontinued Kodachrome in 2006 and replaced it with Ektachrome 64T, those still using the cameras found that they had a real issue. 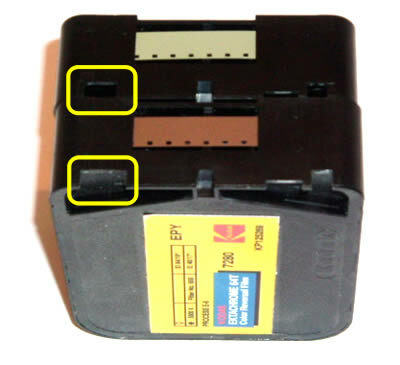 Each Super 8 cartridge has a a series of notches to indicate the film speed to the camera to ensure the correct exposure. Whilst the new Ektachrome stock is compliant with the SMPTE standard defined for the Super 8 system, it is not correctly compatible with the 40/160 cameras which were designed around the 40 ASA Kodachrome stock. Shooting the Ektachrome stock with these cameras results in incorrect exposure. The image below compares the film speed notches for Ektachrome (in front, wider notch) with Kodachrome (behind, narrower notch). Whilst some of these older, automatic cameras are cheap and easy to come by and many can be made to work with Ektachrome stock, they wont be able to accomodate more exotic film types, including negative. Again it depends on your budget and what you want to do with your camera – but picking up a cheaper camera might be your easiest way into the format. Full details can be found on the Kodak site on how to use technically non-standard cameras with Ektachrome 64T film – [click here] or on the Super 8 Wiki – [click here] where a full list of Ektachrome 64T compatible cameras is listed. The Super 8mm cameras aimed at the hobbyist, semi-pro and pro shooter generally can handle the full range of film speeds, thus allowing access to the widest range of film types. Always check full compatibility before you buy – the Super 8 Wiki has extensive camera information – [click here]. Finally, if you want to shoot with the new negative film stocks, you’ll not only need a camera that can read the full range of film speeds, but one with a strong and healthy motor to pull those thicker film stocks through the cartridge. So, where to buy your camera?